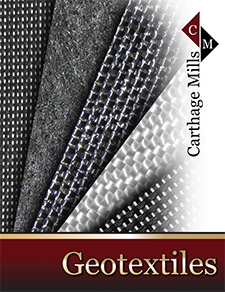 In 1958, Carthage Mills introduced the first in a series of woven 'filter fabrics', or woven geotextile fabrics as known and used today, in an erosion control application as an alternative for granular soil filters. From 1958 to 1967, those first Carthage fabrics were all woven monofilaments, characterized by a relatively high percentage of open area (POA) varying from 6 to 30%, and were the only filter fabrics available on the market. Many of those first fabrics are still in service and produced today (See Geosynthetics: How it all began...). As new applications for these innovative plastic filter cloths were being developed, so did the inventiveness of the weavers and producers of these fabrics. Today, woven geotextiles consist of monofilament, multifilament, slit-film and/or fibrillated slit-film yarns - often in combinations - that are woven into a geotextile on conventional textile weaving machinery using a wide variety of traditional, as well as proprietary, weaving patterns. The variations are many and most all have a direct influence on the physical, mechanical and hydraulic properties of the fabric. The resulting woven geotextiles are typically flexible, exhibit high strength, high modulus, low elongation, and their openings are usually direct and predictable. For more detailed information, click on the links on this page or a specific Product Series in the Menus; or simply call or e-mail us for answers to any questions you might have.